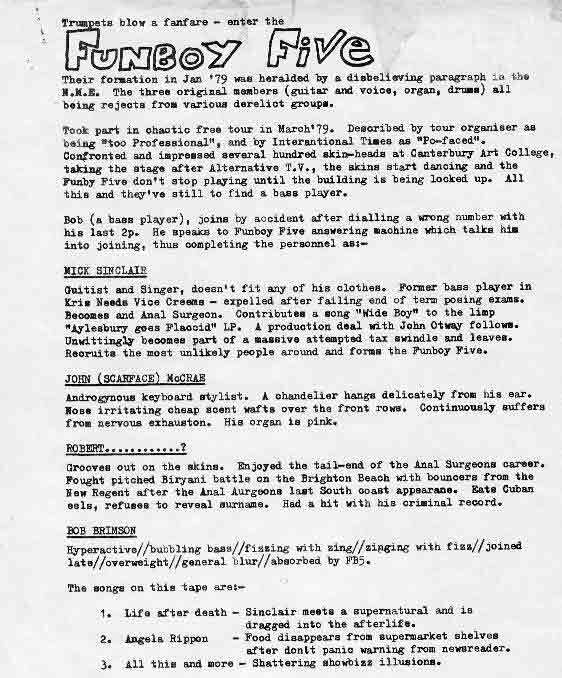 On April 29, 1979, the Funboy Five recorded a demo tape comprising three songs: ‘Life After Death’, ‘Angela Rippon’ and ‘All This And More’. With an uncharacteristic lack of originality, the purpose of the demo tape was to alert record companies, radio producers, DJs, promoters, and any other interested parties to the existence of the group. If they didn't listen to the tape, they could at least read the accompanying press release, complete with entirely intentional spelling mistakes and grammatical curiosities. The tape, if not the press release, was more successful than expected. Most notably, it resulted in the group being offered a session on the influential John Peel Show on Britain's Radio One. Ironically, this occurred despite the group deciding not to send a copy to the Peel Show on account of the hundreds of such tapes the DJ was receiving every week. Unknown to the others, bass player Bob did send a tape and the offer of a session followed almost immediately. The tape also got reviewed in the weekly music paper Sounds: 'Hemel Hempstead four-piece with a sense of humour, semi-deadpan vocals and a pleasant poppy feel. Includes the number 'Angela Rippon Doesn't Lie' so they must be alright.' -- Garry Bushell, 14 July, 1979. 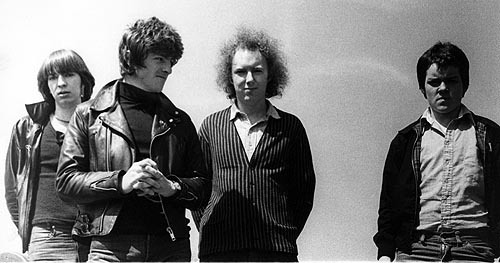 Despite such sudden hysteria, the band found time to be photographed in a field. Left to right: John, Robert, Mick, Bob.